1. Love is taking care of oneself by freeing one’s mind of worries and conducting oneself with propriety. 2. The love one receives is as great as the love that one gives. 3. Love is just like a cup of tea, when properly mixed, it has a wonderful light aroma. If it is too strong, it will be too bitter to drink. 4. We cannot love when filled with suspicion; we cannot forgive when unwilling to believe; we cannot trust when filled with doubts. 5. Wisdom allows love to remain pure and untainted. 6. In this world, there is no one I do not love, no one I do not trust, and no one I cannot forgive. 7. Happiest is the person whose heart is filled with love. 8. A heart of loving kindness enjoys greatest happiness. 9. Life is filled with pain and sufferings, but also with hope and love. 10. Love with expectation would never last. Lasting love must be intangible, pure and unconditional. 11. Blessed are those who have the ability to love and be loved by others. 12. You must first love yourself, before you can love all human beings. Excerpt from Wikipedia: Cheng Yen (simplified Chinese: 证严法师; traditional Chinese: 證嚴法師; pinyin: Zhèngyán Fǎshī; born 11 May 1937) is a Taiwanese Buddhist nun (bhikkhuni), teacher, and philanthropist. 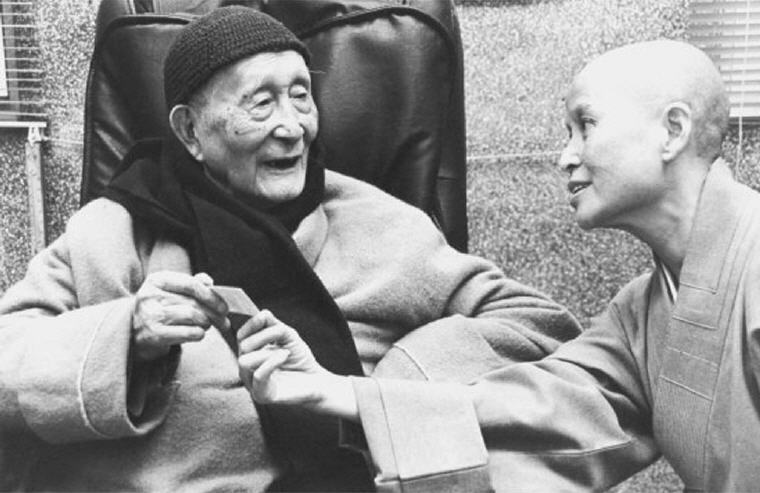 She is often called the “Mother Teresa of Asia.” In 1966, Cheng Yen founded the Buddhist Compassion Relief Tzu Chi Foundation, commonly known as Tzu Chi; its motto is “instructing the rich and saving the poor”. Later, Cheng Yen’s Charity, Medicine, Education, and Culture Missions developed, and to the present the Tzu Chi Foundation has become involved in international disaster relief, bone marrow donation, environmental protection, and community volunteering. 1. One who can show us the right path is a good teacher; one who can walk the right path with us is a good friend. 2. Be grateful always, for everything and everyone, at every moment. 3. As long as one has a strong mind, one can carry out missions without fear of external pressure. 4. Constantly think good thoughts and cultivate ever-growing wisdom. 5. Believe in yourself, but do not be attached in your own point of view. 6. Clear conscience brings peace of mind; the greatest happiness comes from the pleasure of giving and helping others. 7. What matters is not how much teachings one listens to but how one applies them in daily life. 8. Giving others blessings is creating blessings for oneself. 9. Accepting adversities in human relationships with a joyous heart creates positive affinities and generates good karma. 10. Giving is like drawing water from a well; as water is drawn more flows in. It is by giving that blessings continue to flow in. 11. Giving with expectations become miserable when expectations are not met; happiness will be short-lived even when expectations are met. 12. A seed sown in the ground when nurtured mindfully would reap bountiful harvest. 13. To forgive others is, in fact, being kind to ourselves. 14. Be grateful to your parents and all sentient beings. Avoid disappointing them in any way. 15. The four treasures in life are sleeping soundly, eating happily, laughing joyfully and working healthily. 16. Being filial is not making our parents unduly worry about us. 17. Do whatever it takes to do what is right. Do whatever it takes to not do what is wrong. 18. To a beautiful heart, everything appears beautiful and pleasing. 19. Being angry is a form of torturing ourselves with the mistakes of others. 20. To seize the present is to seize the future. 21. Involves me in doing good deeds; excludes me in doing bad deeds. 22. If we have no worries, we will not know where we need improvement. 23. Life greatest achievement is picking ourselves up from failure. 24. Nurture a loving heart from young, so that they will not grow up to have a deviant character easily, and thus creating problems in society. 25. One who has material wealth but an empty soul is the “poor” amongst the “rich”. To give with sincere love and affection is the “richest” among the “rich”. 26. Go on even when it is hard to go on, let go even when it is hard to let go, endure even when it is hard to endure; this is how our character is built. 27. Do not underestimate yourself, because man has boundless possibilities. 28. Only when we light up our heart, can we inspire others to do the same. 29. When we can be in harmonious with one another, conflict or dispute will not arise. 30. If our thoughts are upright and wholesome, we can always be at ease and evil cannot come near. 31. Tolerance and accommodation can prevent disputes, gentleness and great love can transform disasters into blessings. 32. Know your blessings, cherish them and sow more blessings. 33. Those who have great wisdom must all the more be humble and unassuming, just like the rice stalk that bows under the weight of ripe grain. 34. Life is like walking on a tightrope. We are sure to fall if we keep looking back instead of focusing on what is ahead. 35. Giving reaps the greatest harvest. 36. Gratitude is the world’s most beautiful language and the most genuine way for people to interact. 37. Only by treating others with kindness can one lead a happy and peaceful life. 38. A wise person is able to let go, only by letting go can one receives, to receive boundless happiness. 39. Before we criticize others, let us consider first if we are perfect and flawless. 40. One who acts with integrity and a sincere heart will win the trust of others. 41. A fulfilling life is not preoccupied with material objects, prestige, or power. It is a life that is filled with true friendships, sharing, and caring for each other. 42. There are three poisons in life: greed, anger and ignorance. Giving cures greed. Compassion cures anger. Wisdom cures ignorance. 43. Our thoughts and actions create our destiny of heaven or hell. 44. Discontentment brings dissatisfaction, dissatisfaction causes regret. 45. True environmental protection lies in loving the mountains, the oceans and in cherishing all creation. 46. Be forgiving towards others. Be cautious in your speech. 47. One who sows the seed of blessings harvests blessings. 48. Having the ability to help others is a blessing. 49. Never lose courage. Never lose faith. Nothing in this world is impossible when you are determined. 50. The family is an everlasting school; parents are lifelong teachers. 51. Every day is a blank page in life, every person, every thing is a vivid essay. 52. For the peace we wish for tomorrow, start working on it today. 53. Lifting our rear foot while we stride forward means to let go of the past and focus on what we should do today. 54. Remain soft-spoken and forgiving, even when reason is on your side. 55. With confidence, perseverance and courage, there is nothing in this world that cannot be accomplished. 56. With perseverance and courage, the roughest roads can become smooth. 57. There is nothing we cannot achieve if we are willing to think, cultivate and take mindful actions. 58. To a beautiful heart, everything appears beautiful. 59. Gratitude, rather than complaint, opens the doors to life. 60. Start with good intentions and one will head in the right direction. Make good vows and one will have the strength to contribute. 61. A forgiving and generous heart is the fountain of happiness. 62. Many seek illumination by lighting up a lamp, when the true light is within. 63. Showing gratitude is beautifying ourselves. 64. Whether the road is smooth or rough, always be grateful to the people who paved the way for us. 65. Do good deeds and make good wishes each and every day. 66. Use love to melt away all obstacles – with love in our heart, there is nothing we cannot overcome. 67. Nothing is easy to the unwilling. No road is too long for those already on it. 68. We can choose to bear grudges or forgive. With a change of thought, we can tolerate everything. 69. Life is impermanent. It merely exists between breaths, so we must cherish every moment as life ends when we stop breathing. 70. To end the disasters of the world, we must improve the human mind. 71. If we always face all people and situations with a grateful heart, we will be happy and at peace every day. 72. It matters not how much teachings one listens to but in applying them. 73. Happiness is not about how much we possess but how little we bicker over trivials. 74. Take good care of our mindset, then only we could really care for others. 75. In the face of difficulty, just wholeheartedly do our best with all our strength and effort. 76. True happiness is measured by love, and not by one’s possessions. 77. Each day I can open my eyes, it is the birth of a new life, a new beginning to start life afresh. 78. Do not fear making mistakes in life, fear only not correcting them. 79. Taking action is better than thinking and talking about it. 80. Make today count. It comes only once in a lifetime. 81. Make good use of time and cherish what we have, treat one another with love, respect and gratitude. 82. Profound environmental protection begins with profoundly cultivating our inner environment. 83. True meditation is calming the restless mind in everyday living. 84. A sincere smile and a blessing are the greatest forces in soothing the human mind. 85. A person with a generous heart and compassion for all beings leads the most blessed life. 86. Only by giving all one has can the satisfaction of a job well done be gained. 87. If we cannot influence other people, just do what we ourselves should do. 88. The beauty of people lies in their virtue; it is shown through their good deeds, good words, and good heart.